Daisy Wells and Hazel Wong are spending the Christmas hols in snowy Cambridge. Hazel has high hopes of its beautiful spires, cosy libraries and inviting tea-rooms - but there is danger lurking in the dark stairwells of ancient Maudlin College. Two days before Christmas, there is a terrible accident. At least, it appears to be an accident - until the Detective Society look a little closer, and realise a murder has taken place. Faced with several irritating grown-ups and fierce competition from a rival agency, they must use all their cunning and courage to find the killer (in time for Christmas Day, of course). In the past year or two I've been seeing more and more about Robin Stevens and her 'Murder Most Unladylike' mysteries for younger readers. So when I was going through a bit of a festive reading phase over the holiday period, I decided to buy this Christmas-themed tale and give it a go. I'm so glad I did. Although I mainly read adult crime fiction and this is more of a book for younger readers, I still really enjoyed it. I grew up reading the Hardy Boys and Secret Seven books, so this was like a walk down memory lane, while also being a fresh and fascinating take on middle grade mysteries. The fifth in a series starring young friends and schoolgirl detectives Daisy Wells and Hazel Wong sees the plucky pair visiting Daisy's older brother at Maudlin college at the University of Cambridge for the Christmas holidays. It's the mid 1930s, and things are quite segregated at the famed university, so Daisy and Hazel stay with Daisy's great-aunt at one of the women's colleges, while also hanging out (with escorts) at brother Bertie's historic, all-male college, when they can. As the holiday festivities unfold Daisy and Hazel get involved in investigating a series of 'unfortunate accidents' that then become a murder case when a friend of Bertie's is killed. 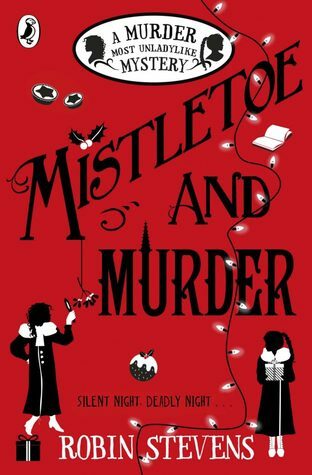 With another young detective pair, Alexander and George, also on the scene, the race is on to uncover what really happened within the walls of Maudlin College, and between the friends and siblings staying there over Christmas. This was my first Wells & Wong mystery, but it certainly won't be the last. Stevens has a lovely storytelling style, easing readers into the mystery with great evocations of setting and establishing characters. There's more than a hint of Golden Age mystery about the whole thing, perhaps slightly knowing or tongue-in-cheek at times. It's great to see plenty of representation in this younger reader mystery - Hazel and another character are from Hong Kong, and there's a pair of brothers of Indian descent. It's a truer description of the times than other mysteries which whitewash history. The prejudices towards women, and those of different races, religions, or 'classes', are threaded throughout the story without overwhelming it or becoming soap-boxy. Stevens really brings 1930s Cambridge to vivid life, as well as the festive season. I absolutely adored reading this over the Christmas period, but I think you could enjoy it any time of year (that just added a lovely extra layer). The mystery itself is good without being amazing, but the overall blend of characters, setting, events, and underlying issues is really top notch. An excellent read for younger mystery lovers (I'd put it in the must-read category), and a good read for anyone.